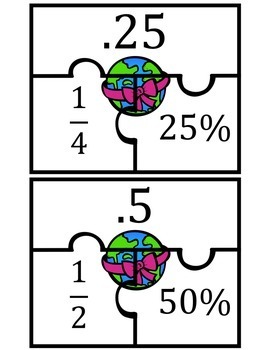 Students will use these puzzle pieces to match up fractions, decimals and percents. 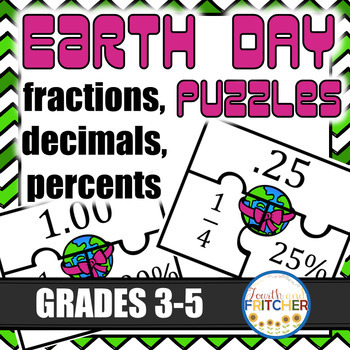 These puzzle pieces are designed to give students reinforcement with the correlations between fractions, decimals, and percents. Print on cardstock. You can laminate for even better longevity. Cut out the pieces. Scramble the pieces. Have students sort! I have included two levels of engagement with this set. The white pieces can be used for students that have mastered conversion and need reinforcement/practice. 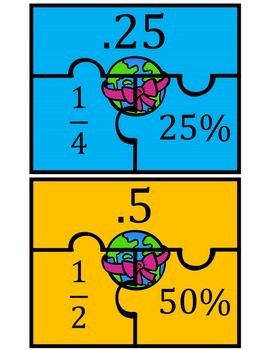 The colored pieces can be used for introducing the skill or reminding students of how conversions are related. Please note: all fractions are shown in the simplest form. This may be a challenge for some students.